This was the third book in the series and I have not read the first or second. I think I would have enjoyed more of the back story if I had. I will be adding those to my TBR pile! Shelley Shepard Gray is a new voice to me in the Amish fiction genre. I very much loved how she tackled a severe medical issue kertoconus (leads to blindness), that I had not even heard about before. 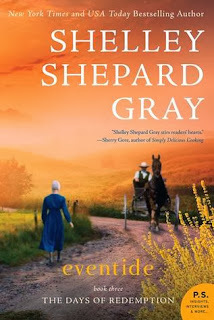 Often times I find that Amish fiction novels just have mild things that they deal with as the conflict. I know that they deal with much more than we tend to think, the same diseases affect them as they do us. If made the story feel more real with this struggle that they were dealing with. My son loves to read and we have Amish in our area. They are very hard working people who yes, have the same struggles as we do. Wonderful review, and a great page. Glad to see you here, seems like there is so many deserted blogs these days. Thanks for letting me visit.